Financial markets in America are the largest and most liquid in the world. In 2016, finance and insurance represented 7.3% ($1.4 trillion) of the U.S. GDP. First, we will look at locally owned and operated banks, known as community banks. Community banks, make up 99.5% of all banks in the U.S.
Because of the scale of business and the way these banks operate, they spend a lot of time and resources to have representation at community events. This includes things like bicentennial celebrations, charity events, festivals, etc. Large chains are run more like a business with a C-Suite and multi-level management, rather than a local board of directors. In addition to things like customer gifts and event apparel, chain banks can use promotional hats for giveaways at grand openings of new branches. There are countless reasons one might seek out a loan, the most common being college tuition, financing a business, or purchasing a home or car. Often times, lenders will take a commission on any loan they approve, so they will be motivated to provide promotional products that will attract new clients. The lender can choose whether he wants to give one of his hats to every potential client, thus further enticing them to finance with his company, or only give them as a gift once customers have signed the dotted line. If you are like me, you probably get at least fifteen pieces of direct mail from credit card companies per week. It is an expensive way to advertise, especially considering if you are like me, you throw all of them away without even opening them first. Surely there is a better way to reach potential customers, right? That is where promotional headwear comes in. 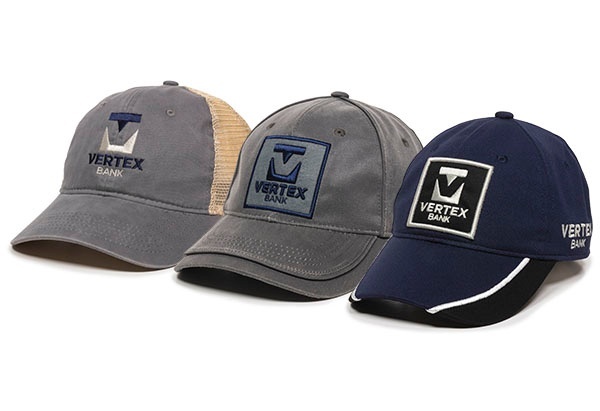 Headwear is one of the most versatile advertising mediums. Your customers, and more importantly, their customers, will love it. Caps are universally enjoyable whether you are reaching out to freelance stockbrokers, or multi-billion-dollar investment firms. As you know, tax representatives are most busy between January 1 and April 15 each year. This is when they do the majority of their advertising. Be sure you get meetings with them early enough prior to the next year’s tax season so that you can deliver a high-quality hat in plenty of time. Insurance agencies insure a number of things, the most common being life, home, auto, and health. It is important to know which type of insurance the agency specializes in prior to going into a meeting, so you can tailor your sample caps to that business. Use your Financial Kit to generate ideas on how to close more sales within the banking and investment sectors. CLICK HERE to order your Financial Business Development Kit, today. We offer selling kits periodically; you will be first to know when new kits are made available.